It is a strange irony that now that hunting with dogs is so restricted there are more lurchers in the land than ever before. Sadly there are more too in rescue centres than ever before. There are too many being bred and too many poor specimens being over-praised. A few years ago I stood ring-side at a lurcher class during a country show and heard one handler singing the praises of his dog. His words told me more about him than it did about his dog, which lacked the build of a hunting dog. It was a not a good lurcher and he was not a good judge of one. A lurcher doesn't have to look statuesque but it has to have the anatomy of a running dog. Historically, if it looked too like a sighthound then the village constable was alerted. But if it couldn't perform like a sighthound then nobody was interested. 'Stonehenge' referred to lurchers well over a hundred years ago with these words: "A poacher possessing such an animal seldom keeps him long, every keeper being on the look-out, and putting a charge into him on the first opportunity; and as these must occur of necessity, the poacher does not often attempt to rear the dog which would suit him best, but contents himself with one which will not so much attract the notice of those who watch him". Strictly speaking, on this evidence, a judge at a lurcher show should automatically disqualify any dog which would appear to a gamekeeper like a coursing dog! That would thin out the class sizes in no small way! 'Stonehenge' has managed however to convey the essential ordinariness, the vital anonymity and the lack of type if a lurcher is to survive. Variety was not just the spice of life, it almost assured a life! 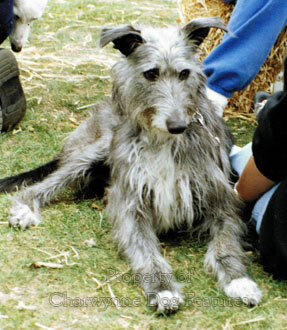 This variation in type manifests itself at lurcher shows today, with classes for rough and smooth-haired dogs and those under or over 26 inches at the withers. 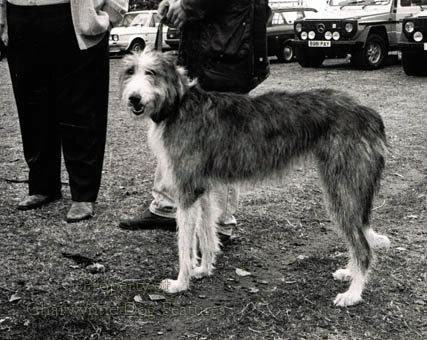 Some breeders swear by the saluki cross and others by Bedlington blood; some fanciers favour a rough or harsh-haired dog and others the smooth variety. A minority prize the 'Smithfield' blood from the old drovers' dogs and there are often more bizarre crosses such as beardie cross Dobermann and Airedale cross whippet. The concept, as always with a hunting dog, is to find the ideal match between quarry, country and conditions on one hand and speed, determination and hunting instinct on the other. The best judge of a lurcher is a man who has hunted one himself, a man who visualises the dog before him in the ring in the chase. But he has to possess some basic knowledge of the fundaments of hunting dog anatomy or he has no right to be in the ring as a judge. I see judges at shows who never look at the feet, never test the hardness of the loin, don't examine the bite, and reward entrants with slab-sides, upright shoulders and rib-cages which lack lungroom. That can only reward bad breeding, leading to a production-line of mediocre dogs; winning dogs get bred from! Firstly, why are so many lurchers so big! It is worth remembering that the main reason why show Deerhounds tend to be huge is not need but origin. Deer hunters found that dogs over 28" at the withers lacked performance and quickly passed them on to the early show breeders. No Waterloo Cup winner has ever been thirty inches high. I regularly see lurchers at shows which stand 30" and which must weigh 90-100 lbs. I would have thought that even on Salisbury Plain or around Newmarket, 60-70 lbs was easily big enough. 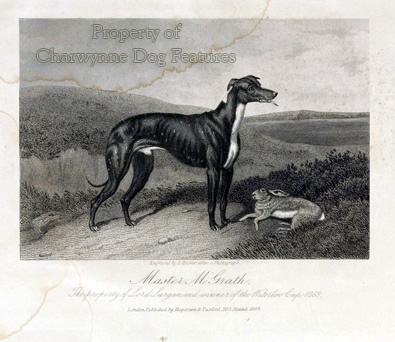 The famous coursing greyhound Master M'Grath, three times winner of the Waterloo Cup, believed by many to have no equal for pace, cleverness and killing power, weighed 52-54 lbs. Wild Mint weighed 45 lbs and Coomassie only 42; both were superbly effective coursing dogs. But whatever their size it is possible to judge these admirable dogs more effectively. If we are going to judge them, let's do it properly. A hound which hunts using its speed must have the anatomy to do so. Immense keenness for work will always come first but the physique to exploit that mental asset comes close second. A lurcher must have a long strong muzzle with powerful jaws and a level bite, with strength right to the nose-end of the muzzle. How else can it catch and retrieve its quarry? The nose should be good-sized with well-opened nostrils, for, despite some old-fashioned theories, sighthounds hunt using scent as well as sight. For any sighthound to succeed, its eyes should be fairly prominent and be set slightly oblique, to the side of the head. One eye should look away to the right and one to the left so that, like any good rangefinder, both eyes can be used for long distance marking. It is likely however that at close range only one eye is used at a time. The neck should be long but symmetrically so, muscular and firm. Length of neck does not improve 'pick up'; flexibility in the 'swoop' comes from the placement of the shoulder blades. A lurcher must have well laid back sloping shoulders; I always apply the 'two fingers width' test to the space between the shoulder blades of a stooping dog. Many show greyhounds have to spread their feet to drink from a bowl of water on the ground because of excessive narrowness in the set of their shoulder blades. The lurcher's back should hint at suppleness and power, be slightly arched in the lumbar region, yet have a mainly level topline. The chest should be deep from the withers to point of elbow but be fairly flat, with the underpart of the brisket fairly broad across. The ribs should be well separated, with good lung room and space between the last rib and the hindquarters to allow a full stride. At full stretch, the impress of a hare's hindfeet is implanted in front of that of the forefeet; the lurcher should have the same capability. There must also be freedom of suspension in the ribcage or thorax in the way it is 'cradled' by the scapulae -- the dog needs to utilise this when hurdling a farmgate or turning at high speed. The hindquarters must be powerfully constructed if they are to propel the dog forward in the chase, but symmetry and balance fore and aft are the key to turning ability. Every sighthound depends upfront on good long arms and forearms, and, in the hindlegs wide and muscular thighs and second thighs, length of stifle and good angulation. The feet must be really compact with well-knuckled toes and short claws, naturally worn from working or sound exercise. Some greyhound experts have been known to assess a dog by looking at the tail first, noting any sign of coarseness, desiring the tail of a rat in appearance, long and whiplike with little hair. Smooth-coated lurchers are sometimes handicapped by too little hair, lacking protection from wire and chill winds. Whilst not advocating a shaggy wolfhound coat, I can see operational merit in a stiff-haired, wire-haired or linty coat. The jacket of any sporting dog should shed the wet not hold the wet. Waterproofing comes from hair density and texture not profusion of coat; if you look at the originally-imported Afghan hounds and then compare their coats to today's specimens, you can see how function has forfeited to fashion. But the best physique is squandered without keenness in the chase and immense determination, an alert eager expression in the eye indicates this and is essential. A judge has to ask himself: will this dog hunt? Can this dog hunt with this anatomy? Better judging, based on a more measured assessment, should lead to the production of better dogs. Fieldsports folk have too much sense to allow such a concept to degenerate into the pretty polly state prevalent in the pedigree dog show rings. Lurcher shows are a bit of fun; the only real test for such a dog is in the chase. But that 'bit of fun' can raise standards too if the judges' criteria are sound. Who wants to win with an unworthy dog?